1 Skuas are large seabirds. They resemble seagulls but are heavier. Skuas can look scary. They are aggressive birds. They are the pirates of the bird world. Skuas often steal their food from other birds. This way of getting food is called kleptoparasitism. Skuas will chase other birds that are carrying food. They will attack those birds in flight and force them to give up the food. Skuas will even gang up on their victims. Skuas don't easily give up but are relentless in their pursuit of victims. 2 Skuas don't get all of their food by chasing down birds carrying food. Some skuas will hang around areas where penguins have nests. The skuas will wait for an opportunity to raid the nesting area and steal eggs and even young penguin chicks. Some skuas do use their hunting skills to find lemmings on the tundra. Skuas also hunt and eat small birds and fish. 3 Two types of skuas live in the Southern Ocean. They are the Antarctic and the south polar. 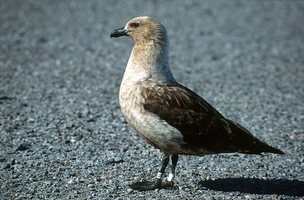 Antarctic skuas are also known as brown skuas. These skuas don't build nests but just lay their eggs on the ground. They lay two eggs at a time. Both the male and female Antarctic skuas take care of the baby skuas. South polar skuas are the world's most southerly birds. They have even been seen at the South Pole. South polar skuas are especially fond of Adelie penguins. During the summer, south polar skuas live near Adelie penguin rookeries and feed on penguin eggs and chicks.